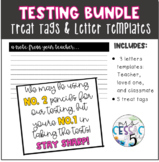 This printable bunting banner has pennants with the letters to spell "ROCK the TEST!". 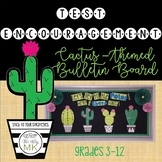 This encouraging banner will help to motivate your kiddos to do their best on any assessment! There are 8 letters, two rockin' kids, and pennant with the word THE. Happy testing! Enourage your students to do their best on the big test! Print out this cute graphic onto card stock and pair it with a rice crispy treat. Great for FCAT Math! 9 days worth of ADORABLE candy/food test encourager tags for students! 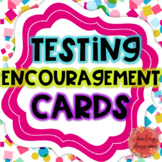 These are to be used for testing encouragement. I printed these onto card stock and used a one hole punch to put a hole in the top and bottom. Then, you can easily slide a glow bracelet through the holes to give your children a little encouragement before a big test. Keep Calm and Donut WorryGive your students donuts the morning of testing along with this cute note!This file includes posters and smaller notes in white, pink, and light green color. Two versions of encouraging notes for students. 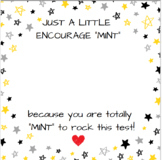 "Kiss the jitters goodbye" "You got this Superstar"
This provides 8 different notes that can be sent home for parents to write some encouraging words to their child before important tests. Print these motivational phrases on cardstock and add it to the staircases in your school building. Your students will get a kick out of reading the motivational and encouraging phrases as they walk up the steps. This resource can easily be printed on colored paper or printed with a color printer, cut and given out the morning of testing as a treat for students. Accompany with doughnut holes or whole doughnuts! 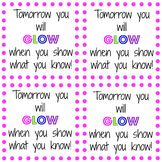 These encourages are cute and simple to use for your class the day of an assessment. These are motivators that will help the students to get pumped and excited about the test that they are taking, whether it be a small or large test. Just a little something to give to students when they are about to take a test. Just download, customize, print, and add your favorite mint! Print up to 6 to a page! Attached are 5 different "play on words" to motivate students to do their best. I bought the candy to match and students were excited and ate the candy after the test. :) The formatting might need a little tweaking based on your computer programming.